I am a child of the black middle class. I wasn't quite a teenager when Martin Luther King Jr. was murdered. But I have always known that I am one of the millions of beneficiaries of his sacrifice. I have spent a career considering the term as it relates to black people. In 1968 only roughly one in eight black households could have been defined as middle class. But a decade later, thanks in large measure to affirmative action — the real and empirical legacy of the King Dream — that number soared to about one in four households. As sociologist Bart Landry noted in his landmark book The New Black Middle Class, the number of affluent black folks grew during the second half of the '60s by a number greater than the total increase during the previous 50 years. Like their parents before them, my mother and father were born, raised and educated in segregated, rural outposts of North Carolina. Somehow, they overcame. The stories they passed along suggested hard work, education and unyielding faith as the tools they used to carve out what passed for a middle-class existence in the midst of a system that denied their very humanity. But there was something more intangible. 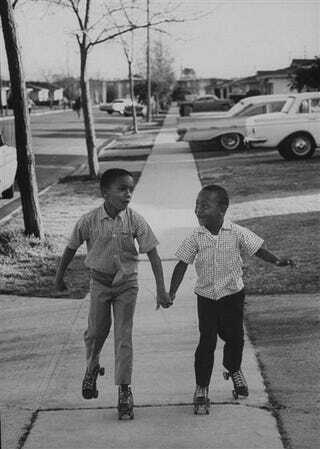 Call it a love for black people and a sincere desire to see one and all move upward. For my direct ancestors, in the days before the Civil Rights Movement made things seem easier, being middle class wasn't so much an economic term as a mindset of survival. It had less to do with the size of a paycheck, and more to do with a determined familial effort designed to absorb the countless, daily indignities of life. It was about creating cocoons around family units and entire communities to shield us all from the shared sting of second-class status that we experienced outside of our protective enclaves. All black folks in the segregated South lived cheek-by-jowl. My preacher father's house was next door to the gas station attendant's home; the dentist up the street shared the block with a guy who fixed televisions in his garage. What made a black family middle-class wasn't easy to define. Nobody tossed such terms around back then. As I came to understand class stratification, I assumed it meant some black folks had enough food and money to share with those who didn't. If my folks knew about it, no needy family in my neighborhood went hungry or was evicted from their house. But times changed. My education began with Dr. King's murder. I learned not long afterwards that not all black people felt as positive toward other black people as we did back in McCorey Heights, my corner of the world in Charlotte, N.C. Money – or access to a job in the white mainstream – became increasingly important as a fault line, separating brother from brother, sister from sister and, in some bizarre cases, child from parent. In the time since King died, the power and prestige of America's black middle class has both waxed and waned. There are more affluent black people in the United States than ever before. In 2001, the top 5 percent of the nation's black households had higher incomes than 85 percent of white households. You know the folks in this 5 percent —Oprah Winfrey. LeBron James. Sean "P. Diddy" Combs. Bob Johnson. Stanley O'Neal, late of Merrill Lynch. Regular folk aren't doing so bad either. Indeed, by some Census Bureau measures, a quarter of all black households are middle class. Some demographers say that figure is too low, counting nearly half the nation's African-American households as middle class. Studying the black middle class, as I have done throughout most of my professional life, is an enterprise fraught with peril. It's easy for critics to distort quantitative results, turning them into qualitative indictment. More than a century after W.E.B. DuBois coined the phrase "Talented Tenth," an argument still rages over who does and who doesn't make up the black elite, an argument that misses the point entirely. DuBois understood, as King did later, that middle-class black Americans have an obligation to do more than play at "acting white." And this is where the study of class and race in America gets dicey. I suspect it's because so few of us really know our history. No society prospers without a strong middle class that assumes responsibility for lifting those from the bottom of the well. Today's black middle class function often as nomads, estranged from the brothers and sisters of lesser means. They have ceded the authority of their considerable affluence to trade on the money-making stereotypes of what it means to be black and American. Of course you wouldn't know it from watching television, listening to pop music or, even reading magazines that black men don't all covet blonde models. Or that all black women aren't booty-shaking harlots willing to do anything for a brief moment in television's glaring lights. Apart from the few, easily ridiculed critics like Bill Cosby, where is the outrage from those who know better? Or ought to know better? The overlooked truth is that in the 40 years since King died, black America's middle class has become a forceful mainstream rushing upward, onward and over the people who were once their neighbors. And in the midst of progress, the middle class has granted the pseudo-credibility of silence to a nihilistic street culture that has risen simultaneously—denigrating all that King's death made possible. Those who study black folk's history know that King's movement was a peaceful, civil rebellion. It was led by young people, who wore Sunday suits and smart dresses as they stood up to sit-down. They were black and middle-class in their present-day values and forward-looking expectations. It was that combination of values and outlook that laid the foundation for the Civil Rights Movement and the assent of a people from slavery and segregation to possibility and prosperity. It will be those values that guarantee our continued survival in a land that still can be hostile to black skin. We, black American middle-class citizens, seem to have amnesia. Perhaps, we don't remember because we've forgotten where we came from and how we got over.